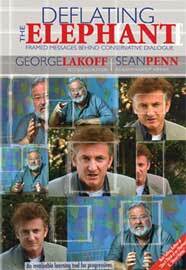 Deflating The Elephant: Framed Messages Behind Conservative Dialogue featuring George Lakoff and Academy Award Winner®, Sean Penn, teaches us how language impacts our lives and more significantly, our political discourse. Language is influenced by what is known as "framing", meaning every word is connected to a concept. How those concepts are used and repeated have proven to shape ideology, behavior and thought-process. George Lakoff, author of Moral Politics: What Conservatives Know and Liberals Don't and Don't Think of an Elephant: Know Your Values and Frame the Debate, dissects the conservative dialogue and provides explanations and examples on how they have spent the last 35 years perfecting their ideas and their language. Framed messages is a system and strategy that works. The key is to understand why it works. "It is fascinating and a completely incredible documentary...Lakoff is a modern prophet in the style of Marshall McLuhan and Neil Postman." "...if you're a free thinking individual who wonders how the nation got to this "us vs. them" point in the political dialogue, you may want to give this lecture a listen."